British Airways cabin crew have voted overwhelmingly in favour of strike action in a dispute over job cuts and changes to staff contracts. The strike will take place over 12 days from 22 December to 2 January. Cabin crew voted by nine to one in favour of the strike action, with an 80% turnout. 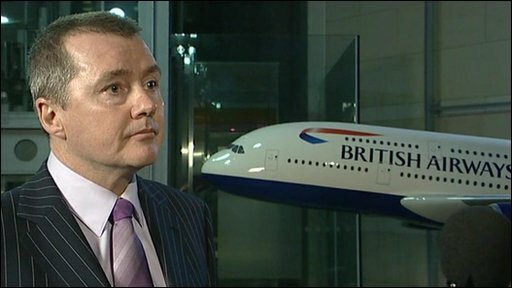 BA's chief executive Willie Walsh said the decision was "cynical" and betrayed "a lack of concern for our customers, our business and other employees". 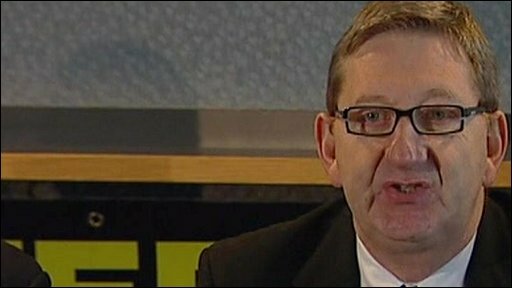 Len McCluskey, assistant general secretary of the Unite union, said: "It goes without saying that we have taken this decision to disrupt passengers and customers over the Christmas period with a heavy heart." He stressed that the union was keen to continue negotiations. "We will wait, ready to meet, anytime, anywhere, 24 hours a day, to try to see if we can resolve the dispute." BA's chief executive Willie Walsh said the company would be doing everything it could to limit the effect of the strike action. "We are going to look at all our options [to minimise disruption]; operational, legal and industrial relations options," he told BBC News. BA offered passengers who are booked to travel during the strike period - or 48 hours either side of it - the chance to rebook their flights at no extra cost. Otherwise it said it would inform customers of changes to its schedules by email or SMS text. "We will use the contact details supplied at the time of booking, so we ask customers to please ensure these are correct and up-to-date," BA said in a statement. Mr Walsh said he had told the Unite union he was available for talks, but was uncompromising on the central issue of the dispute. "The changes that we introduced in the middle of November will not be reversed. Those changes enabled us to offer voluntary redundancy to 1,000 cabin crew and those people have left the business." BA's Chief Executive Willie Walsh: "It's a cynical exercise"
Unions are unhappy about job cuts and changes to staff contracts, which they say they have not been consulted on. BA has reduced the number of cabin crew from 15 to 14 on all long-haul flights, and has frozen pay for two years. Unite said that the cuts involved imposing "significant contractual changes" on cabin crew employees, resulting in extended working hours, and reduced wages for new starters. BA says it urgently needs to cut costs to ride out its dire financial situation. Last month it revealed it had lost £292m in the first half of the year - the worst period in its history - and said it would have to cut a further 1,200 staff. On Monday it emerged that the financial position of the loss-making airline had taken a sharp turn for the worse. The trustees of its two pension schemes have told the company that the schemes now have a combined deficit of £3.7bn. It is not yet clear how serious the disruption will be or which flights will be cancelled, or what compensation will be available to affected travellers. Simon Calder, travel editor of the Independent said that those affected might find it difficult to arrange alternative travel plans. "This is going to cost one million people their Christmas trips," he said. "The travelling public are going to be absolutely appalled that so close to Christmas they have been left with no other options. "There are no seats available on most other airlines, if you do find alternative seats it is going to cost you a fortune," he told BBC News. Shares in BA ended Monday trading down 0.2% or 0.3 pence to 201p.